Plantar fasciitis can be a very painful condition, and it can also be tricky to treat. Many of the people who are affected by plantar fasciitis are runners. New runners who develop plantar fasciitis often don’t fully recover from the injury for at least five months, with some taking as long as a year to recover. In the past, there has been a lack of quality evidence to provide us with answers on how to treat plantar fasciitis. Fortunately, that is changing. In 2006, a paper by Scott Wearing discussed the similar pathology of plantar fascial issues and tendinopathy. This information begged a new question: can we treat plantar fascia issues in the same way as tendinopathy? Michael Rathleff and his colleagues have answered that question in an interesting new paper that was recently published. This paper offers a new approach to treating plantar fasciitis that could provide for relief for the many people who are suffering from these issues. If you have plantar fasciitis, you know that the worst pain often occurs when you first wake up and try to stand up from your bed in the morning. It may feel like you are trying to walk on broken glass. This isn’t a great way to wake up and start your day. It’s frustrating and depressing. It’s not uncommon, though. Plantar fasciitis is estimated to affect 3.6 – 7% of the general population. It is also responsible for as many as 8% of all running injuries. The lifetime prevalence of plantar fasciitis is 10%; this means that 10% of the general population will experience plantar fasciitis at some point in their lives. If you don’t personally have experience with plantar fasciitis, you surely know someone who does. Most of the studies that have examined methods for plantar fasciitis have looked at forms of non-exercise intervention such as orthotics and plantar specific stretching, or combinations thereof. These treatments have certainly offered a significant measure of improvement. Despite these improvements, a portion of patients continue to experience symptoms of plantar fasciitis two years after their diagnosis. Treating plantar fasciitis can be quite a challenge, particularly for patients who have a long history of symptom duration. Due to this duration of symptoms, researchers are looking at other options for treatment. Recently, researchers realized that there are similarities between the pathology of plantar fasciitis and tendinopathy. It has been known for some time that high-load strength training is an effective treatment for tendinopathy, so the researchers decided to try this same approach for treating plantar fasciitis. They performed a study that compared high-load strength training against a standard, plantar-specific stretching program for the treatment of plantar fasciitis. There were several variables that needed to be addressed before the study could begin. The researchers needed to identify how they could induce high tensile forces on the plantar fascia in order to replicate the loads that were placed on the patella tendon during high-load strength training, such as a leg squat. They decided to perform single-leg calf raises and employ the windlass mechanism. A towel was used to flex the toes, which is intended to tighten the plantar fascia during the dorsal flexion. As a result of this motion and the physical proximity of the plantar fascia to the Achilles tendon, the high load of the Achilles tendon is transferred to the plantar fascia. The test examined 48 patients whose plantar fasciitis had been verified through ultrasonography. The patients were randomly assigned to two groups of either high-load strength training or plantar specific stretching. Patients should complete the exercises that they were instructed in by their therapist, as this will increase the likelihood of improvement in their pain levels. Do not run until you have been free from heel pain for four weeks and you are able to walk 10 kilometers without pain. If you must wear dress shoes, it is essential that you use the gel heel inserts in them. Keep doing the exercises, even when your heel pain starts to go away. Continuing the exercises will help to prevent the pain from returning. You may experience mild pain while performing the exercises. However, if the pain suddenly becomes worse in the 24 hours following the exercises, you should notify your therapist. Do the exercises precisely in the manner you were instructed. Consult the training leaflet if you don’t remember how to do them. Avoid any activities that aggravate your heel pain. When you are ready to return to these activities, do so slowly and carefully. The group that was assigned to plantar specific stretching was carefully instructed in how to perform this stretching. The patient would sit with the affected leg crossed over the other leg. They would wrap their fingers around the base of the toes (using the hand on the affected side of the body), and pull the toes backward, toward the body. They would continue to pull the toes back until they felt the arch of the foot stretching. During the stretch, the patient would palpate the plantar fascia to ensure stretching. This stretch was to be performed in sets of 10 for 10 seconds each, three times per day. The group that was assigned to high-load strength training was also instructed in how to perform their exercises. Their exercise involved performing unilateral heel raises while a towel was placed under the toes. The purpose of the towel was to activate the windless mechanism. 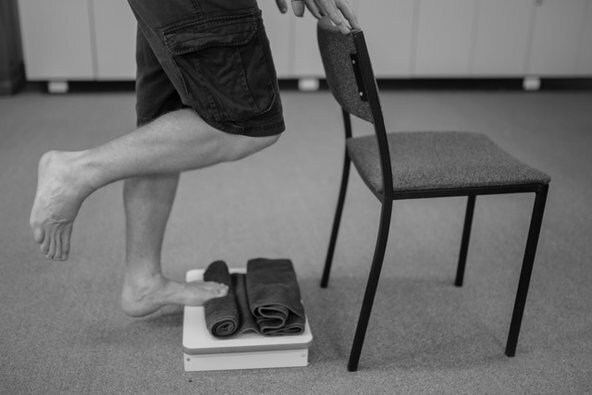 The size of the towel was customized for each patient in order to achieve maximum dorsal flexion at the top of the heel rise. During each exercise, the patient would go up for three seconds, pause for two seconds, and come down for three seconds. The exercise was performed every other day for three months. The participants began with three sets and a maximum of 12 repetitions. Two weeks into the trial, the load was increased by having the participant wear a backpack full of books while performing four sets of 10 repetitions. Four weeks into the process, the number of sets was increased to five, while the number of repetitions was decreased to eight. The participants continued to add books to the backpack as they gained strength. The Foot Function Index was used to measure the results. 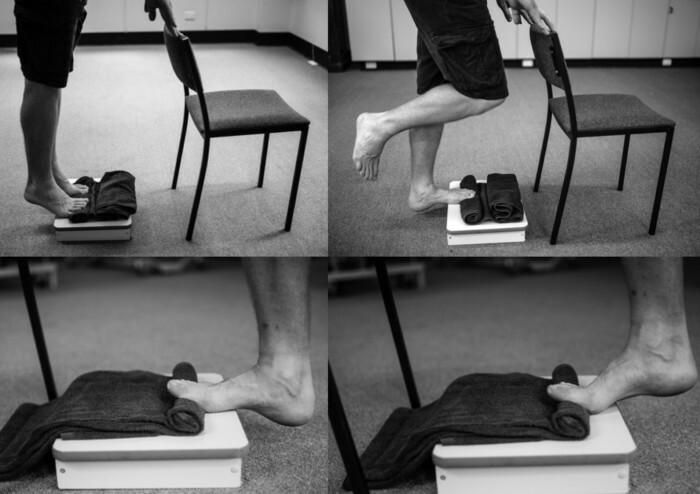 After three months, the patients in the high-load strength training group scored 29 points lower on the Foot Function Index, which suggests that the high-load strength training programe offers better results than traditional plantar specific stretching. Long term effects of both options were similar, but the high-load strength training group experienced better and quicker short-term pain relief. Why does high-load strength training work for treating plantar fasciitis? The specific explanation for this is not yet fully understood. However, researchers believe that this type of treatment may stimulate the production of collagen, which improves the structure of the tendon and increases the ability of the plantar fascia to withstand a load. One of the great things about this option is that it is simple and low-tech. Most anyone can perform this exercise at home with items that they have laying around the house – a towel, a backpack, and a few books. You simply stand, barefoot, on the affected leg on top of a box or step. Place a rolled up towel under the toes of the affected foot, and allow the heel to hang over the edge of the step or box. The other leg should hang loose, with the knee slightly bent. Raise and lift the affected heel slowly, counting three seconds up, two seconds pause, and three seconds down. Once 12 repetitions can be completed easily, begin wearing a backpack full of books while performing the exercise. In the past, it was believed that plantar fasciitis was caused by inflammation of the plantar fascia. As a result, plantar fasciitis was typically treated with over-the-counter anti-inflammatory medication or cortisone injections. However, new scientific developments have led doctors and physical therapists to change their thinking about how to treat plantar fasciitis. Scientists now believe that plantar fasciitis actually has very little to do with inflammation, which means that anti-inflammatory medication and cortisone injections are not useful forms of treatment. Stretching becomes the go-to recommendation for treatment. Thanks to the Rathleff study, we now know that high-load strength training is a superior option to plantar-focused stretching. In the Rathleff study, the participants all used gel inserts in their shoes during the course of the study. Orthotics, arch supports, and gel inserts can provide a great deal of relief from plantar fasciitis pain. These devices provide additional support to the foot. They also help to reduce overpronation, which can lead to dorsiflexion. When the foot overpronates, it twists from side to side instead of receiving the distribution of the body’s weight properly. The plantar fascia should receive the weight of the body from the heel forward to the toes. Using orthotics and arch supports helps to retrain the foot so that it receives the body’s weight properly and reduces the impact of plantar fasciitis. In fact, studies show that many patients report that a change in footwear was the best form of treatment for their plantar fasciitis pain. Anyone who experiences heel pain can benefit from wearing shoes that have a supportive heel counter and stiff midsole. Most shoes don’t provide sufficient arch support, which can aggravate the effects of plantar fasciitis. Adding orthotics or arch supports to your shoes can give you the support that your feet need while still allowing you to wear the shoes that you like. If you experience heel pain or plantar fasciitis, come in and visit with the experts at Foot Solutions UK. At Foot Solutions UK, we specialize in helping our clients reduce or in some cases, eliminate plantar fasciitis pain through the use of proper footwear. We offer many different options to meet your needs. We have a range of over the counter arch supports as well as custom arch supports. Many different types of arch supports are available in stock, or we can order custom devices that are made specifically to fit the individual contours of your feet. We also have many types of supportive shoes, and we can even customize our shoes to provide you with an absolutely perfect fit. Don’t suffer from plantar fasciitis pain any longer. Visit Foot Solutions UK today.